We traveled in one more chance to Pontevedra, specifically to Ponteareas to know a story that moves away from the side of mystery and sometimes paranormal phenomena of earlier texts for this while addressing a plot that has two young lovers protagonists, giving thus the municipality of one of the most exciting legends we see in Galicia. The Picariña, or stone of love as it is commonly known in the area, hosts behind a story that will not leave indifferent day, preserving many of the stereotypes we see in this style of stories. According to legend, two young men who responded to the name of Tristan and Aldina should keep their deep love in secret, why? The family of the girl did not agree to anything that relationship because of the tensions and disputes over land several Alvaro - Aldina father - wanted and were in possession of Tristan. Alvaro fought alongside the Catholic Monarchs in Granada. Returning from the war, he wanted to see his daughter, who in recent days had found in horseback riding a distraction, the principle reason for passing along the castle Sobroso, strength in his beloved lived. The girl's father, not finding his daughter in his castle, sent a page to the look. This was soon to find her and inform that Aldina Alvaro had been seen in the company of Tristan. If before the young knight Don Alvaro hatred won, now the story would go much worse. One afternoon, Don Alvaro turned to stone abalar meeting point for young people. There he could see with his own eyes as Tristan waited for his beloved. It would be the last time. Alvaro crossed the boy's chest with his sword, hiding the body in the undergrowth. Here begin the ordeal of Aldina. The initial concern that Tristan missing his appointment soon became cries, wails and all kinds of negative thoughts. Why the young did not want to go to the stone where they had sworn eternal love? Would you have thought of something? By pure intuition, Aldina felt the call to go to the stone, needed to go to the place in which he looked with Tristan. After waiting a few minutes, he appeared a black knight on horseback. "Tristan, at last you come!" Said the girl. However, terror filled the face of Aldina after the gentleman removed his helmet. The bells filled the air. "Aldina, my love. Those bells announce my funeral. Our love has been truncated by death. " As is the specter of Tristan uttered these words, he mounted his horse and disappeared. Aldina retreated to the castle of his father. The days passed and she saw no consolation. Suddenly, during one of those sad nights, all the castle windows closed in unison, opening the door that led to the burial ceremony. 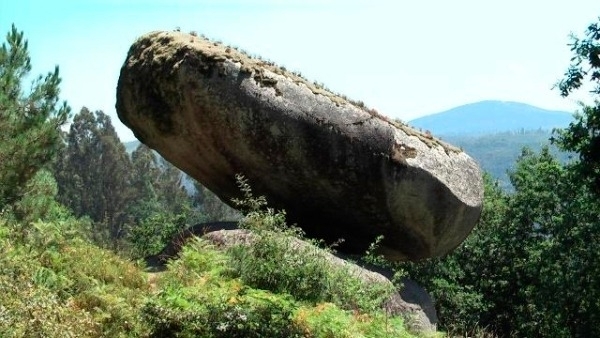 Today, as we said a few lines ago, the stone has become one of the best-known points of Pontevedra. Couples continue to flock to the famous enclave in order that both Aldina as Tristan, are able to ensure a good future in their relations. It is sufficient that three laps are given, according to legend, around the place says that the magic do the rest reporting solutions sentimental, labor and economic problems and ultimately, any bump on the road can separate from the person we love. 1 reviews Distance to Santiago: 65 km. Parece mentira que se puedan mantener así. 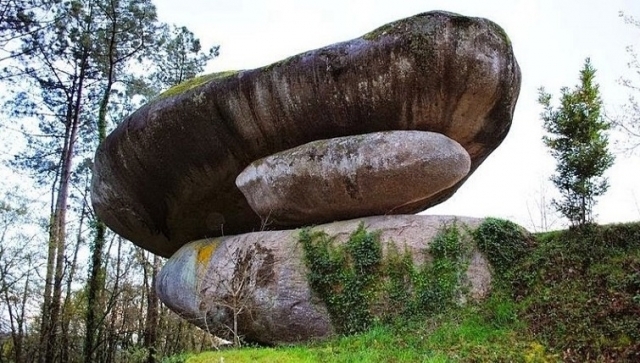 Naturaleza en su máxima expresión, la de casualidades que se han tenido que dar para que queden así las piedras. Buena leyenda gallega. No conocía este lugar ni la historia del lugar sobre ella.